Considered both helpful and confusing, notification laws are expanding. Four states have laws in place and 11 have pending legislation, plus there is a federal bill in the US House of Representatives. Is breast density notification too much information for women? The pervasive thought among breast imagers is that it may not be the amount of information but what follows that could further complicate women’s breast cancer screening decisions. Most breast imagers believe knowledge about breast density will prove beneficial, but it may complicate women’s screening decisions, lead to confusion about screening follow-up, increase the potential for false-positives, and create additional healthcare costs. In four states—Connecticut, New York, Texas, and Virginia—the plain-language report that women receive following their regular screening mammograms must now include information regarding whether they have dense breast tissue. With legislation pending in at least 11 more states and a bill introduced in the US House of Representatives, women across the country may be learning more about their breasts—regardless of whether they want to or know what to do with that information. It is common knowledge within the breast imaging community that dense breast tissue is one factor determining whether a woman is at high risk of having undetected breast cancer. Dense breast tissue contains less fat and more connective tissue, which appears white on a mammogram. Cancer also appears white on a mammogram, and thus tumors are often hidden behind the dense tissue. However, dense tissue is not the only factor when labeling a woman at high risk of breast cancer. In its position statement, the ACR supports an FDA mandate that dense breast tissue notification be included in the mammography report. The organization also supports patient education and encourages patients to “take charge of their own care” but remains cautious when it comes to how this information will be interpreted. Similarly, in a letter to the FDA’s National Mammography Quality Assurance Advisory Committee on recording breast density in mammography reports and patient lay summaries, the Society of Breast Imaging supports the dialogue between patient and physician regarding breast density. However, the society remains cautious regarding whether the specifics of breast density are beneficial or will lead to confusion or other unintended consequences for women. The ACR believes consistency is a key part of integrating dense breast notification into the mammography process, beginning with the language used in the report summary. What constitutes dense breast tissue is another consideration within the issue. 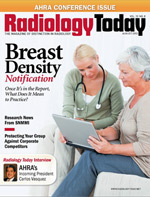 The ACR’s Breast Imaging Reporting and Data System classification, designed to standardize mammography reporting and reduce the confusion in breast imaging interpretation, describes four categories of breast tissue density and instructs radiologists to include this density information in the medical report. In its statement on dense breast notification, the ACR says it would support an FDA mandate that this same information be included in the mammography report. Weigert adds that a density-measuring algorithm does exist, but the software can be cost-prohibitive to some facilities. Consistency is a pillar of breast imagers’ attempts to maintain a high level of confidence in mammography, which remains the gold standard when it comes to detecting breast cancer. Studies have reported varying statistics regarding what age to begin screening mammography and how often to perform it. The US Preventive Services Task Force recommendations issued in 2009 reignited and complicated the debate about when and how to screen; some worry that dense breast notification may further complicate the discussion. There is some concern that for women with fatty breasts, such information could convey a false sense of security. One unintended consequence of dense breast notification is the potential for increased ultrasound orders and the accompanying risk of more false-positives and benign breast biopsies. Mammography plus ultrasound performed by trained expert radiologists detected more cancers than mammography alone in the ACRIN 6666 study, Monsees says. However, the study, which involved women who were already at high risk of breast cancer, also revealed that the combined screening strategy of mammography and ultrasound resulted in far more recalls, biopsies, and recommendations for short interval follow-up than mammography alone. As states begin to implement this legislation, education plays an important role in the first stages. Weigert says in the first several months after Connecticut enacted its law in 2009, she found that many referring physicians were not aware that the legislation had gone into effect. Letters sent to physicians explaining the law includes suggestions for how to prepare staff and patients to handle this new aspect of breast screening. The next steps for radiology practices could come in the form of new technology, particularly in the ultrasound realm. With the standard handheld ultrasound performed in most cases, Weigert says the process is full of variables. Technicians may use slightly different techniques as they scan patients. The process is labor intensive, with the technician looking closely at the monitor to make sure they capture everything necessary to provide the radiologist with a proper view of the patient. Weigert believes that implementing automated whole-breast ultrasound would make the process a “true screen,” with the technician taking all the images and then providing an entire data set for the radiologist to read. However, while FDA-approved automated ultrasound technology exists, the equipment is expensive and not often covered by insurance. Weigert suggests that establishing a code for screening breast ultrasound could help pave the way for more insurers to cover this modality as a follow-up to screening mammography. Right now, ultrasound is considered a diagnostic code. One ancillary benefit of breast density notification is that this recorded information is then available for use in studies and clinical trials. In Weigert’s case, she now has a pool of women from which she can gather data for study purposes. In 2011, she presented a clinical study of more than 1,000 patients that looked at how breast-specific gamma imaging (BSGI) plays a role in early breast cancer detection by adding specificity as well as sensitivity to breast cancer detection. Comparing BSGI with mammography and ultrasound, the study concluded that BSGI has greater sensitivity and comparable specificity compared with ultrasound and mammography. Three of the cases used in this study were discovered through dense breast notification. While the issue isn’t specifically on the merits of ultrasound, the data surrounding the use of this modality as a follow-up to mammography does play a role in the dense breast notification debate, particularly when insurance companies are deciding whether to cover screening ultrasound or MRI. A concern among breast imagers is that unless supplemental screening is reimbursed by insurers, there may be a disparity in follow-up between women who can afford to pay for the additional screening exam and those who cannot. As dense breast notification legislation begins to spread across the country, more breast imagers are assessing the pros and cons of providing women with this level of information. Weigert admits that she was not a believer at first, noting her concern for an increase in false-positives. Her acceptance is increasing, but she is still looking for more good evidence that this is the right decision for women. Nearly 20 states and the federal government passed, rejected, or are currently considering legislation that mandates notification of dense breast tissue. While the language varies from state to state, the clear message is that referring physicians may soon be sharing with patients more information regarding the status of their breast health. Since 2009, Connecticut, Texas, and Virginia have instituted laws that require radiologists to notify patients if they have dense breast tissue. • Connecticut passed its law in 2009. In addition to notification, the state’s legislation requires insurers to cover additional screenings with a doctor’s referral. • Texas passed its law in June 2011. In Texas, however, the legislation, which went into effect three months after it was passed, does not provide for health insurance coverage of ultrasound or other breast screening modalities. • Virginia passed its law in February 2012 with an effective date of July 1. This legislation includes language that alerts women to breast density but does not suggest they seek further screening. The law also does not provide for health insurance coverage of ultrasound or other breast screening modalities. In addition, bills are pending in 12 other states. In New York, for example, a bill was introduced in May that would require health insurance companies to cover supplemental breast cancer screenings when a mammogram indicates dense breast tissue. It also requires that the patient and her referring physician receive written notification of a finding of dense tissue and the need to consult regarding additional screening. On May 29, the California Senate passed a bill requiring women with dense breast tissue be notified of this fact in the letter they receive following their mammogram. According to the bill, those women would be informed that dense breast tissue can obscure abnormalities on a mammogram and that they may want to consult with their referring physician the possibility of obtaining additional screening. In October 2011, California Gov Jerry Brown vetoed that state’s first dense breast notification initiative, citing a need for a standard of care regarding breast density risk. Also, the governor asked that any language in the bill be more informational in nature and less directive as to a course of action. At the federal level, the Breast Density and Mammography Reporting Act of 2011 was introduced in the House of Representatives in October 2011.